John Ruskin’s Four Essays on Political Economy, published in 1860, have become a point of departure for theorists and practitioners of ethical economy. Ruskin took issue with the claims to objectivity to political economists, suggesting that the veins of wealth were in fact human veins, and that moral questions should be a central part of financial evaluation. Club of Rome, 1972: Club of Rome published an article Limits of Growth in which they stressed on the failure of sustaining the world economy on the shoulders of limited resources and hence laid the foundation for future developments on Environmental Economics. The European Union Commission published a paper calling for a better growth indicator than the GDP which tended to exclude social inclusion and other socio-economic characteristics. Stiglitz-Sen Commission: In February 2010 , the French and the German governments pushed the European Union to accept the need for a better growth indicator, based on the work of two Nobel laureates, Joseph Stiglitz and Amartya Sen .The Commission concluded that such indicators would require metrics from at least seven categories: health, education, environment, employment, material well-being, interpersonal connectedness and political engagement. Henderson’s Analogy: Cahn used Henderson’s analogy of the economy as a large cake (see diagram below). 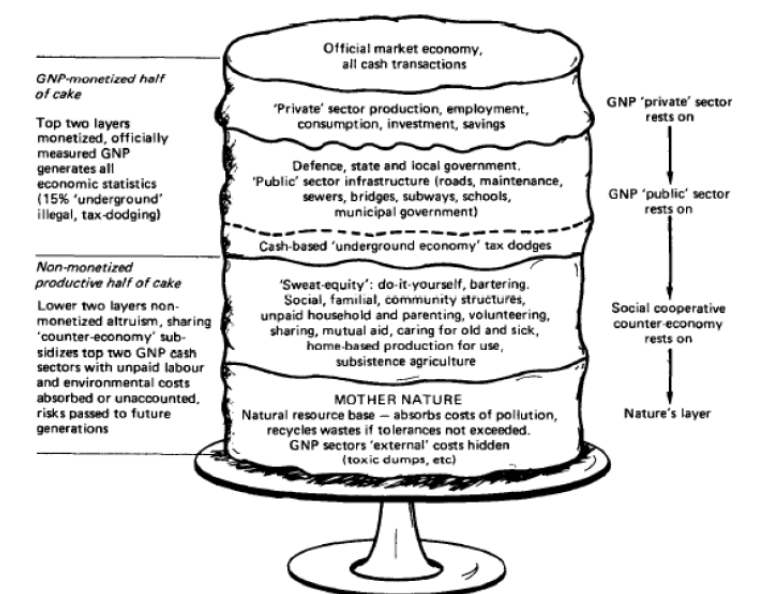 The topmost layer of the cake is the market economy, represented by GNP. The first layer rests on other lower layers, such as the non-market/core economy of human society, and education, or the natural resources of the earth. All the bottom layers subsidise the top GNP layers with un-paid labour and environmental costs. Here, the key insight offered by Edgar Cahn is to point out that in these fields of caring and civic mindedness, the non-market, or ‘core’ economy is actually more efficient than the market. Cahn finds linkages between community economics and his understanding of the core economy. He foresees that much as laws have begun to change to value and protect the environment, the economy of community and neighbourhood will need to be better protected and valued. In this context, perhaps with some overstatement, he presents time banks as community preservation efforts. Fig. 1: Three-Layer Cake with icing representing “productive” systems in society (Henderson 1989). Time Banks: Community Currency or Volunteering Initiative? i. Greco Analysis: In his book on money systems, Greco classifies two major functions of money: a medium of exchange and a measurement of value. Credit should be free-flowing and easily accounted for and measured. Time banks face major difficulties in tracking down and calibrating the flow currency (here time). Its non-record ability and non-traceability points out a fundamental flaw in this system. ii. Logie: Richard Logie, CEO of GETS Plus, a community currency consultant, pointed to other flaws in time currencies. As credits can continued to be issued, without being backed by anything other than a promise to repay, weirdly, the system comes to resemble the debt currency of the conventional banks. With so many time currencies in circulation, and without enough attractive options to redeem them, time credits tend to become devalued. Time banking fundamentally resembles, in the words of its founder, Sir Edgar Cahn, “A baby sitting pool” where one hour of babysitting for your neighbour is equivalent to their one hour of babysitting for you. People hold deposits in the form of hours due by the other deposit holders. It’s not necessarily altruistic in nature but citizens habituating in co-production. However, this one-to-one mechanism runs into difficulties when one cannot find a match for his job. For example, a dentist cannot find a painter to paint his ceiling or a lawyer cannot find a cleaner to tidy his house. Most of these difficulties arise because of the inability of these time banks to expand their scale of operation. They are very local and tend to serve to limited needs strictly. Unless the numbers of members are increased, time banks will continue to suffer from such diseconomies of scale. A Time bank is essentially a small-scale initiative. If the number of members surpasses a limit, it incurs substantial administration costs. A time bank requires hundreds of co-ordinators who might or might not want to work in terms of time-currencies. Hence, method of payment for the staff poses a dead-end. Moreover, thousands of members engaging in uncountable series of exchanges causes exhaustive amount of paperwork for recording and legalising each transaction. Operational difficulties often cause many time banks each year to shut down. Government Aid can only be realised up to a limit, hence there is an utmost need for improving the working efficiency of time banks. Moreover, lack of payment as salaries to these staff fails to attract the target employees. Many critics question the sustainability of such time banks. As pointed out in the previous topic, the staff often avoids payment in time currencies. Moreover, apart from these administration costs, each time bank has to incur huge IT costs as well. While you no longer have to “license” the most common software (as its gone open-source), there is still a substantial maintenance and support cost monthly software updates and customization by paid software contractors. It’s not rare (at least overseas) for the software contractors indulged to get paid $80/hour, and if something breaks into their systems which requires specialist know-how, that additional un-budgeted cost is hundreds of dollars per incident. Very few time banks have their own in-house volunteer software support group, the vast majority have to contract this out to a few specialized groups of software geeks. Most of the time banks operate their own servers (directly or indirectly), so that incurs an additional hosting cost. Such costs can be detrimental to the setting up of time banks, and hence it requires substantial initial funding costs. Moreover, as these funding costs are perennial and non-interest-bearing (because 99% of the time banks are not-for-profit organisations) it keeps private investments away. Although recently, the ruling state has come up with numerous tax-deductions on the loans given out to these time banks in order to render them sustainable and ever-growing. "The Need for Better Growth Indicators." UKEssays.com. 11 2018. All Answers Ltd. 04 2019 <https://www.ukessays.com/essays/economics/growth-indicators-4940.php?vref=1>. "The Need for Better Growth Indicators." All Answers Ltd. ukessays.com, November 2018. Web. 25 April 2019. <https://www.ukessays.com/essays/economics/growth-indicators-4940.php?vref=1>. UKEssays. November 2018. The Need for Better Growth Indicators. [online]. Available from: https://www.ukessays.com/essays/economics/growth-indicators-4940.php?vref=1 [Accessed 25 April 2019]. UKEssays. The Need for Better Growth Indicators [Internet]. November 2018. [Accessed 25 April 2019]; Available from: https://www.ukessays.com/essays/economics/growth-indicators-4940.php?vref=1.